Holiday season is officially in full swing and while the majority of us have packed up the house and jetted off to foreign lands, some of us remain, baking in the heatwave. So what’s left to do but take ourselves off to one of the fabulous beaches the U.K has to offer. 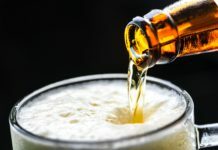 One of our Gin Funders recently asked the question of where the best beach is in the South East and the Gin Fund crew came up trumps to give their recommendations and top tips. Below is a list of the most recommended beaches in the South East (in no particular order), what to search for, what to avoid and the ultimate guide to parking. Photo by Gemma Sultan Boss from Mummy’s Gin Fund. 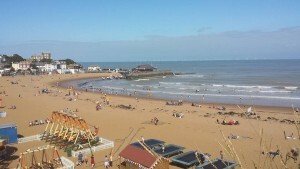 I’m a massive Broadstairs fan… but that’s not all about the beach. I love the little town and there is a lovely hotel with an outdoor area overlooking the sea. I love it because it offers more than just the beach. I love Morellis, which makes the best ice creams there, the bandstand and lovely Victorian feel of the place. 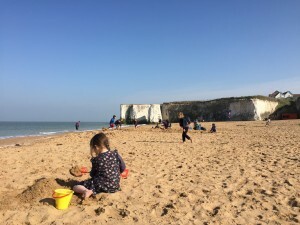 We went to broadstairs a few weeks ago and we parked in the eastern esplanade was free parking and 10 min walk to the beach but now it’s school holidays, you need to be there really early to park. Broadstairs is great for crabbing. Beware of seaweed at times. Broadstairs is beautiful- about 2 hours drive though and don’t eat fish and chips on the beach as you will essentially be buying it for the sea gulls. Photo by Kerin Applepine from Mummy’s Gin Fund. The beauty of Joss Bay is that it’s all about the beach, there’s very little surrounding it. It has a quaint, old fashioned feel to it. If you turn left as you leave the car park you can drive past the Lighthouse Keeper’s cottage and see the still functioning lighthouse. We we went on Monday and it wasn’t heaving, there was a nice amount of people but the beach next to Joss Bay has a restaurant and stuff but gets really busy. As for the toilets they are as clean as any beach toilet can be…. I’ve seen a hell of a lot worse! You can park on the road facing for free. They have a little cafe and shop and wrist bands: £5 for bouncy castles and trampolines. Spent the day at Joss Bay yesterday. My friend took her folding sun loungers so we didn’t get too sandy, it was lovely but take toilet roll as toilets never have any. No dogs permitted between 10am – 6pm, 1st May – 30th September. Photo by Rebecca Asker from Mummy’s Gin Fund. Camber is the sort of beach that resembles a small child’s drawing of ‘the seaside’. 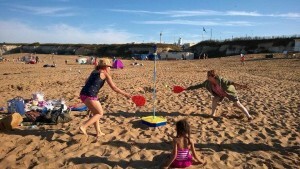 There are miles of golden sand, streams for children to paddle in once the tide has gone out, boats on the horizon, waves, shells, seagulls, ice-cream, deckchairs and windbreaks for hire. Camber Sands is great and lots to do with cheaper parking dotted around the place. 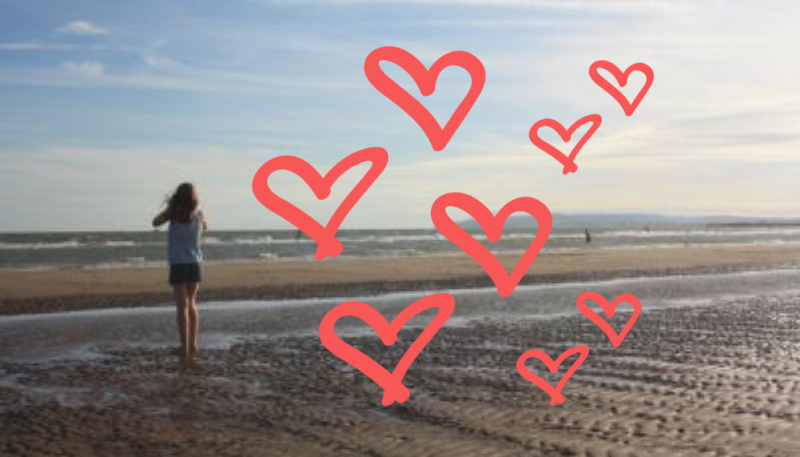 At Camber Sands you can get blown away by the wind as it’s very open – we recommended everyone wears sunglasses to protect their eyes from sand. Sitting on Camber Sands at the mo. Calm, warm and tide going out. Car Park £10 for 6 hours and flat for pushchairs etc. Loos, beach shops , sand dunes and lifeguards on patrol. What more could you ask. Heaven! Dogs are allowed but must be on a lead and restricted between zones F & H.
Dymchurch is one of the best, been going there for years. There are a few small arcades and children’s rides and a lovely fish and chip shop right by the seafront. Dymchurch is fab. Was there a couple of weeks ago and it was brilliant. 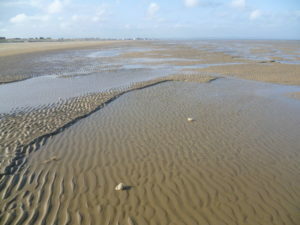 St Mary’s Bay In Dymchurch is only an hour and an easy drive from SE London. 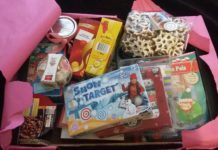 Lots for kids in the town too. Only problem is that at high tide you can’t get on the beach – check tide times! Dymchurch has such a beautiful sandy beach with a joyful funfair just up from the beach, lovely restaurants for all the family. It really is one of the best beaches we go too! No dogs permitted 1st May – 30th September. Photo by Cathy O’Hare from Mummy’s Gin Fund. I love this beach! It feels like the perfect beach – golden sand, white cliffs, swimming at high tide and wonderful rockpools to explore when the tide is out. Go through the stacks and you will see even smugglers’ caves carved out of the chalk cliffs. If you’ve seen posters at train stations advertising Kent beaches – this is the one in the picture! I played here as a child and now my children love it too. Botany Bay is nice for families and is definitely a scenic and gorgeous beach. Compared to somewhere like Margate or Broadstairs the beach is much quieter and more secluded even in summer, although it does still get busy on a hot weekend. It is a lesser-known spot, more used by locals than tourists. At other times of year there are few people there at all but I have spent many happy hours with the kids poking hunting for shells, peering into rockpools and chasing seagulls – it’s wonderful to have that space to yourself. Minnis Bay is great for a shorter drive (North Kent coast). There’s not much there which is perfect I think. A park, a pub, a few shops in the town and free parking. 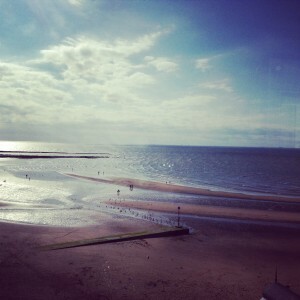 Went to Minnis Bay today, highly recommend! Lovely, fuss-free beach for little ones! 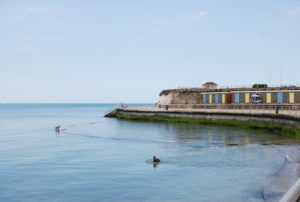 Minnis Bay is the perfect beach to visit on a day trip from South London. In fact, if you visit during the week ‘off-season’, you may be lucky enough to meet members of the Nayland Boat Sea Angling Society who will happily regale you with tales of their 1950s childhood day trips from the Lewisham area to Minnis Bay. 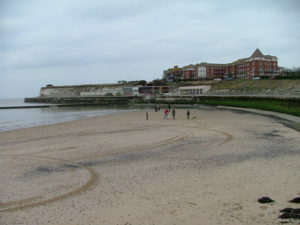 As there are no arcades or similar amusements on Minnis Bay, people who visit tend to do so because they want to enjoy the beach, the view or to cycle along the Viking Coastal Trail (an excellent way to combine your child’s Viking topic with a day out that doesn’t involve the unpleasant fragrances at Jorvik and is much closer to SE London). It’s less popular than Westbrook Bay or Margate but definitely makes for a more relaxed day as there are a limited number of things that can be nagged for. The beach is sandy and at low tide offers lots of space for sandcastle-building and beach fun. There is no shade unless you set up shop against one of the stone groynes. 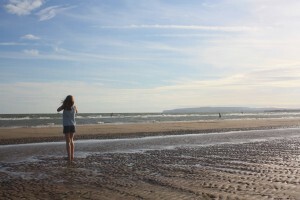 Bournemouth is worth the drive. The beaches are lovely!! Literally like being on holiday. Lovely relaxed attitude on the beach, with public showers and loos and a brilliant promenade with lots of cafes, bars, shops and restaurants. Stunning, wide sandy beaches with so much to see and do. Greatstone is lovely & doesn’t get as busy as Camber Sands. If you go, it’s behind the car park with the basket ball pitch. Parking is about £6 for the day. There is nothing other than the beach so the kids can’t make their demands. Take a cool box, something to sit on and some shade and you’ll have a fantastic day. There is a chip shop across the road and a pub and a few restaurants. Ice creams at the shop next to the chip shop. But that’s all! 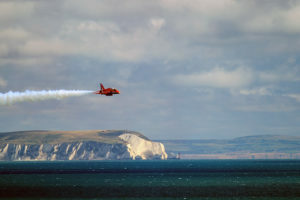 A combination of fresh winds and the flat sandy beach devoid of groynes makes Greatstone popular with a whole range of wind-based sports such as kite surfing, kite boarding and land yachting. In fact, it is argued that Greatstone is one of the best land yachting sites in the UK. No dogs permitted 30th May – 1st October. 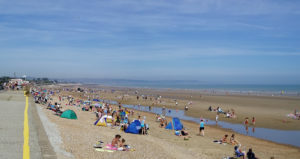 There is a lovely sandy beach located in West Bay with plenty to do from exploring rock pools to building sandcastles. Great amenities including toilets, chalets to hire, a cafe and a pub. Sunsets from West Bay are breathtaking. The rock pools at West Bay are brilliant. So much to find. Be careful though, there is no beach at all at high tide. Worth noting that dogs are not permitted on the beach between 1st May and 30th September between the hours of 10am and 6pm. Always check the tide times. Photo by Nicola Orbine from Mummy’s Gin Fund. An award winning beach, next to a theme park, what more could you ask for. Interesting walks in all directions along the Thanet coastline. Shabby-chic shops and atmospheric cafes. Of course, the beach at Margate is a beauty – a large sweeping expanse of sand so huge that even on a busy day you can find a quiet spot. When the tide is out there is excellent exploring to be done amongst the rocks. When the tide is in, you can go crabbing off the jetty with equipment bought on Marine Drive. Home to the much acclaimed ‘Great British Pizza Company’, declared by the Telegraph to be ‘simply the best pizza in the land’. (They are not wrong). On a sunny day, you can hire deck chairs and let the kids squeal with joy on the beach-based fairground rides. Loving our work? Get more of it in your life by following us on Twitter, Instagram and Facebook. Read more of our brilliant blogs here. Got something to say? 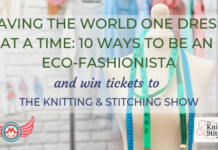 Join our #MGFBlogSquad. Aoife is a first time Mum to Elodie and can't quite believe she has made it through the first year of motherhood in one piece and with (most but not all) her sanity still in tact! She enjoys anything crime related (watching and working with) and her beloved daughter spent her time in the womb listening to the clinking of keys around a prison as mummy did her day job (Mum wasn't actually a prisoner)! Now back at work full, time, she didn't realise just how tiring it would be but quite enjoys spending all of her wages on the luxury of Costa coffees in the mornings. Aoife loves coffee, Gin, cheese, fake tan, a good book, a good giggle with the girls and watching a series from start to finish in one weekend! She would post her twitter page link here but she cant remember her log in details and actually has no idea how to use twitter! !